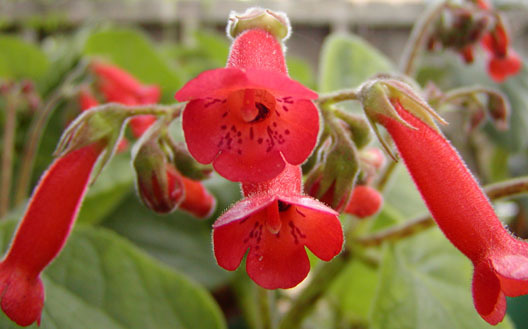 Sinningia lineata is an attractive, easy-to-grow species with orange-red flowers atop (usually) two pairs of large leaves per stem. The tuber can get very large with age, both in cultivation and in the wild. S. lineata flowers have spots at the entrance to the tube. The name of the species comes from the dark streaks on the stems, petioles, and flowerstalks, as can be seen in a picture of a flowerstalk. At the time of the 1988 Sinningia Register, there was a lot of confusion between this species and S. macropoda. The Register considered S. lineata to be a synonym of S. macropoda, but in the 1990s it was determined that in fact the names represented distinct species. Most of the plants grown under the name S. macropoda in the 1970s and 1980s were in fact S. lineata. 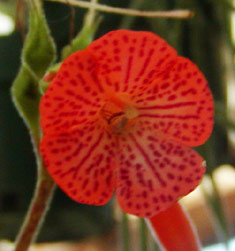 Sinningia macropoda is not nearly as common in cultivation as S. lineata. I started S. macropoda seed from the AGGS Seed Fund around 1976, but the plant I got was S. lineata. The picture above shows the plant in 2003. There is also a picture of its tuber. This plant is one of the parents of Sinningia 'Peninsula Belle'. As of May 2013, the plant is still flourishing. It blooms well every year. It is my oldest sinningia. The plant does have one difficulty in my environment: caterpillars. Because it is outdoors and blooms early in spring and has plain green leaves (which appear to appeal best to the moths around here), it is particularly vulnerable. I have to be vigilant, watching the apical buds for signs of the pests. The primary symptom is leaves dwarfed and curled over to conceal the developing vermin. This is the place where I tell one of my favorite stories. 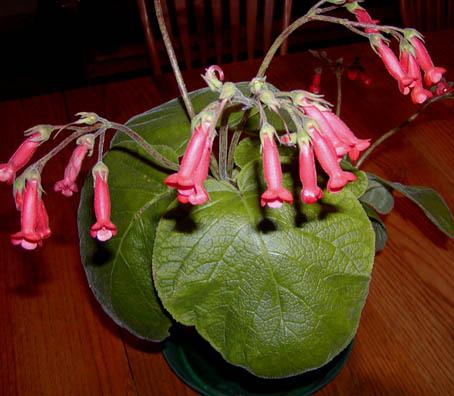 In 1984, the annual convention of the American Gloxinia and Gesneriad Society was held in northern California, in San Mateo, a city about 15 miles south of San Francisco. I had never attended a convention before, much less entered a plant in a convention show. But this particular year, my youthful plant of Sinningia lineata put on a spectacular display. Usually, it is through blooming by the middle of June, but this year it peaked right at convention time. I had dreams of grandeur as I brought it to the entries table. It was loaded with flowers. It had perfect leaves. Who knew how high it could go? And then I saw the killer: a gorgeous Sinningia leucotricha with multiple stems, spectacular leaves, and dozens of flowers. When the culture is the same, it comes down to genes vs. genes, and face it, Sinningia leucotricha has better genes. Long story short: it got 98 points, mine got 97. My wonderful plant didn't even get a blue ribbon. That leucotricha went on to take Best in Show. Losing out to the Best in Show, well, there are worse things that can happen. But most important, I got a priceless gift. That was 1984. This plant had never before looked as good, nor has it ever done so in all the years since then. I was able to show it to an international membership at its lifetime peak. And now, every spring, when I look at that plant blooming, I am reminded of Tom Polka, the exhibitor of the splendid leucotricha, a fine person and perhaps the San Francisco chapter's best grower, who died almost 20 years ago. I learned a lot from that 1984 convention. In 1999, the GRF expedition saw S. lineata growing in muddy ground beside a creek. It was Brazil autumn, and the foliage was very tattered. Some of the tubers were already dormant. They were easily the biggest tubers we saw in Brazil on that trip, up to 12 inches [30 cm] in diameter. Jon Dixon got seed from the AGGS seed fund a number of years ago under the name "highly spotted clone". This seed yielded a number of lineata-like plants, with a variety of spotting in the flowers. This picture shows the one with the most spotting. The flower is almost peloric (see the discussion of floral symmetries), but the flowers hang downward instead of being upright like peloric versions of S. speciosa and S. cardinalis. This is one of those species which takes quite a while to reach maturity. If you sow seeds, you must be prepared to be patient in waiting for the first bloom. In hybridization, however, this slowness can be negated by appropriate choice of mate. S. 'Peninsula Belle' is S. lineata x reitzii. When I selfed this hybrid, the resulting F2 plants took several years to bloom. When I crossed S. 'Peninsula Belle' with S. conspicua, on the other hand, the hybrids bloomed about a year after germination. Crosses with S. 'Texas Zebra' bloomed less than a year after germination. It appears that the rapid maturity of (for example) S. conspicua and (in 'Texas Zebra') S. eumorpha trumps the slowness of S. lineata. Time from seed may also have to do with culture. S. piresiana has been another slow bloomer from seed for me, but two plants obtained from crossing it with S. 'Peninsula Belle' bloomed within 16 months. Does anybody know why botanical citations insist on abbreviating people's names? Anyway, Rechsteineria lineata was published by "Hjelm." in 1937. The Plant-Book by Mabberley gives a "Hjelmq." as Karl Jesper Hakon Hjelmquist (b. 1905), which is in the right time range. Alain Chautems transferred this species to Sinningia in 1990.